Browns Builders Merchants and its trade body, the BMF, want more done to ‘change the ratio’ between the small number of large builders and the large number of small builders to foster a diverse, functioning housebuilding market. 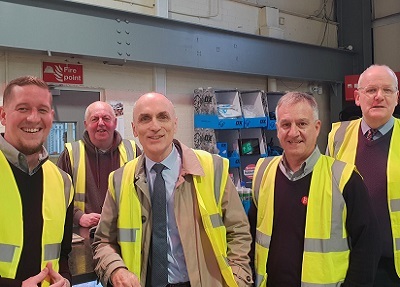 After visiting the new branch, Derby North MP Chris Williamson said, “I was delighted to visit Browns and it’s great to see a long-standing Derby business flourishing. I pay tribute to Branch Manager, Lea Armstrong, and the team in opening a new branch. Better quality and more affordable housing is urgently needed to improve constituents’ lives. As a former bricklayer myself, I know merchants play a vital role in housebuilding and especially the repair, maintenance and improvement market. I wish them continued success in the coming years”. Jim Parlato, Director of Browns Builders Merchants, added, “We were pleased to welcome Chris Williamson and show him how Browns has evolved over a hundred and fifty years. We have chosen to invest and expand our business by opening a second branch to give better service to our trade and retail customers. It is great to have our MP take an interest in Browns and I hope Chris can help to raise the profile of merchants like us in Parliament”. This visit was another arranged by the BMF as part of its industry and parliament programme. The aim is to show MPs how trade essentials and value-added products move from quarries, brickworks, sawmills, and factories to where they are needed - and to outline the role, value and importance of merchants in delivering for their communities.